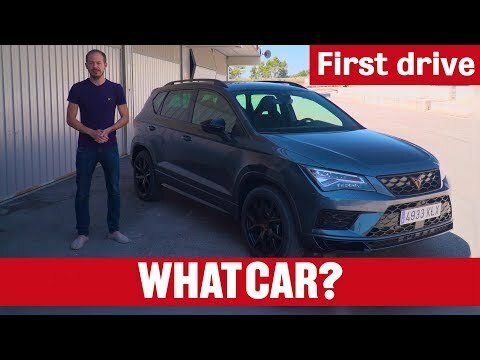 CUPRA Ateca – the first model to be launched under the new brand. The CUPRA Ateca SUV has won the inaugural Sports SUV of the Year category at the 2019 What Car? Awards at a ceremony in London in early 2019. Judges commended the CUPRA Ateca for its unparalleled fun factor versus its more expensive rivals, costing thousands less than its rivals! Click Here to read the full report. The CUPRA Ateca’s 2.0 TSI engine delivers 300 PS and 400NM of torque.This technologically advanced engine works with a newly designed Otto Particulate Filter System to fulfil the latest Emission Legislations.This engine comes with a powerful sound, and is equipped with a newly developed DQ381 7-speed DSG gearbox that has been developed to offer sportier gearbox feel with faster, smoother and more precise changes. The gearbox’s development has been modified to combine excellent performance with efficiency. The CUPRA Ateca offers a striking exterior look. At the front, its upper grille features a honeycomb effect with the new CUPRA logo in the centre. The CUPRA letters are in matt aluminium on the lower grille. The black brake callipers, a sporty rear bumper, the copper CUPRA logo on the boot, the four exhaust pipes on the edge of the rear diffuser and exclusive 19” diamond cut alloy wheels with the CUPRA logo all enhance the sportiness and elegance of this unique and dynamic SUV. The CUPRA Ateca offers a striking exterior look that instantly distinguishes it as a high-performance vehicle. It exudes confidence and leaves no doubt that the the CUPRA Ateca is an extremely dynamic SUV. At the front, its upper grille features a honeycomb effect on the inside with the new CUPRA logo at its centre, reinforcing its lineage. On the lower grille the CUPRA name sits subtely and is finished in matt aluminium, just above the exclusively designed bumper. The CUPRA Ateca’s highly sculptured front end continues with the signature full-LED headlights, which not only offer tremendous luminance but also underscore the SUV’s broad, muscular stance and purposeful appearance. As soon as you unlock the doors, LEDs in the exterior mirrors illuminate the area close to the door sills, projecting the CUPRA’s logo and lettering onto the ground. Once inside, the CUPRA Ateca’s interior exudes a combination of driver-focus, comfort and refinement, and the perception of a vehicle designed to meet the highest performance targets, while at the same time is able to carry its occupants in complete comfort. The CUPRA logo is embossed on the floor mats, the key and the multimedia system touchscreen when the engine is started. The door panels are upholstered in Alcantara®, with the CUPRA lettering illuminated on an aluminium plaque, standing proud on the door sills. The sports seats are also upholstered in Alcantara®, in black with copper stitching, with a carbon fibre effect covering the sides. When cocooned in the driver’s seat, the driver will also see the copper stitching continue on the sports leather steering wheel, which also houses the CUPRA logo embossed at its centre, and gear knob. The pedals are finished in aluminium to complete the feeling of being in control of a special vehicle. Elsewhere in the cabin, the high-end feel continues with the climate control air vent frames finished in silver or gloss black as an optional, as is the central console which houses the drive select control system and gear shifter. Directly in front of the driver is the digital cockpit that provides information in the clearest of forms thanks to its crisp, high-resolution display, supported by the 8-inch touchscreen navigation system plus. Both of which help affirm the sense of refinement.